Guitar players are well known for their special addiction to gear. As often said, there are musicians, and there are guitarists ! Some of us just plug and play, and others just cannot help tweaking, modifying or even creating their own custom gear. Time, more than money, is the only limit to this endless quest for the perfect rig: as we say in France, a guitarist will eat pasta till the end of the month in order to buy gear, but he will buy it. Now, imagine someone with the right skills, both in mechanics and electronics. Someone with an over-developed sense of sound perfection. Someone with a endless imagination, and with such a personality that when he decides to do something, he just does it. Imagine, cerise sur le gateau, someone with money, enough money to create a company to work on his custom gear. You may say it's impossible... Well, Tom Scholz is this "impossible" person, and the company was named Scholz, Research & development. The sound of Boston's debut album is still, 30 years later, a sort of mystery. Most of the tricks are public now, but this sound will never be duplicated. Or, as someone said on www.gonnahitcharide.com, it was duplicated once: on Boston's second album. The problem Tom Scholz had to solve was not to create this sound: he had the skills and gear for that, and he actually was Boston. 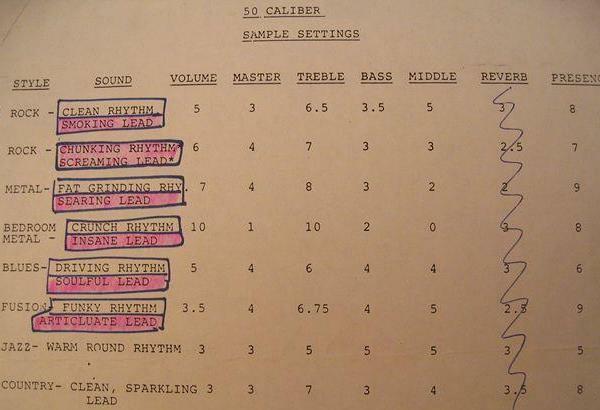 The gear of Boston, for the first two albums, was therefore a collection of highly-modified stock gear. The result was here, but each take has probably taken hours of preparation and gear tweaking. Had Tom Scholz worked from one album to another, letting his gear dictate the sound, he wouldn't have bothered creating SR&D. But Tom Scholz is a man who has the sound he wants in mind, and he will not stop until his gear provides exactly this sound. The problem when you work that way is to be able to get the same sound week after week. Some famous records were made in a very short time, with a lot of funny anecdotes. But the sound of these records is lost. It will never be repeated. These were one-shot takes, almost live, and no-one will ever do it again. That's not the way Tom Scholz works. A song can take weeks, months or years before he can say it's finished. That means a given guitar part can be played hundreds of times. So the problem that Tom Scholz had to solve was to have some equipment that would, take after take, produce exactly the same sound. In the mid-seventies, guitar gear was still in its teen-age: SR&D was one of the companies that helped this gear becoming adult. The unique approach of SR&D, and the reason why Tom Scholz has created the Rockman gear, was to obtain a sound that would not only comply with Boston's requirements, but also a sound that would be perfectly repeatable. The first commercial product by SR&D was apparently a very simple device. A volume control box ! Cause playing several hours a day with huge stacks tearing your ear-drums can become extremely unpleasant after a few weeks. Let's see what this "Volume Control device" was made for, and why it was so special. The guitar rock sound has been created, in the sixties, with tube amps. That's a fact. Vacuum tubes are, from a technical point of view, very poor quality components. They wear out when you play, they heat, are very sensitive to mechanical shocks, and have a very poor Power Supply Rejection Ratio (PSRR...). But in these old days, solid state amps were not reliable, not powerful enough. All in all, we grew up with the sound of tube amps in our collective memory, and in 1975, there was no alternate solution: a rock'n'roll guitarist played with tube amps. 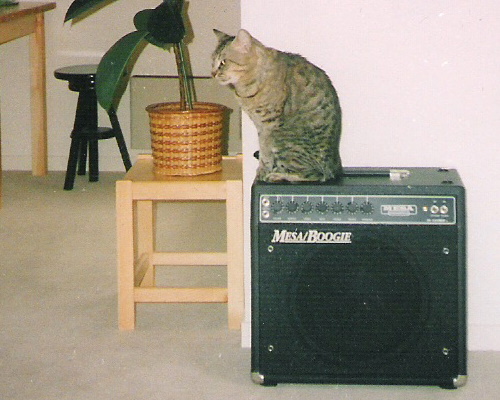 Moreover, good amps were huge, cause good amps were designed for professional musicians, who play in large venues. The standard 100W stack was the common standard, and the modern concept of a 10W high-end tube amp was still science-fiction. If you read a little about tube amps, you know that their specific sound comes from the power-amp section: in fact, a complex interaction between the tubes themselves, the way they clip when they are overdriven, the way the power-supply is pulled down in the meantime, and, last but not least, the output transformer. In other terms, the preamp is not sufficient to give that warm tube sound we like, and the power section must be driven loud to play its role. Tom used Marshall amps to create his sound, cause it's the sound he liked. Randall Smith had brought a huge innovation to the guitar amplifiers when he introduced the master volume and higain preamps, in 1969. Marshall amps were not designed that way, and the only way to get this warm, rich and creamy Marshall tone is to drive them loud. Very loud. Turn the master volume down, and you lose this special sound we like. Even with a master volume, and a special higain preamp, designed to give a correct sound at lower volume, a Boogie sounds good only above 3 or 4/10. That's damn' loud for a cat! There is a special "bedroom metal" setting, but if you look at Mesa's sample settings, it is clear that this setting is not "normal". And this 1/10 position rapidly becomes a dead-spot on the master volume pot, as I soon noticed. Randall Smith has invented the master volume. Tom Scholz has created something more: a device that allows setting the exact sound you want, while controlling the acoustic volume without altering the sound of your amp. 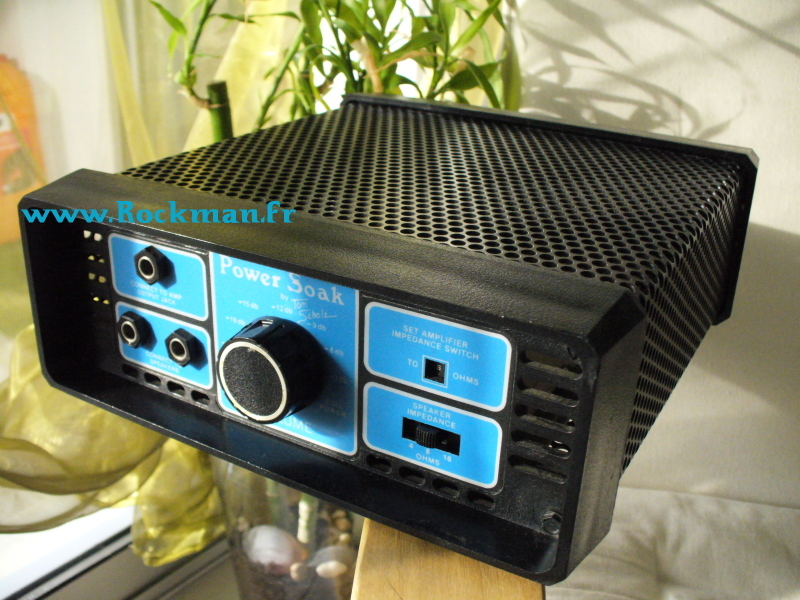 In other terms, a guitar amp equiped with Tom Scholz's Power Soak had two gain pots (one for the preamp, one for the power section, used as a second saturation stage) plus a genuine "constant distortion volume control", placed between the amp and the speaker. The Power Soak is often called "dummy load", but it's not only a dummy load. It is sometimes called a power attenuator: power attenuators already existed, years before the Power Soak. Even this second designation is not 100% correct: the Power Soak is a volume control, designed to work with high-energy currents. Beside the main volume control function, the patent of the Power Soak identifies two extra objectives: allow playing at full power if required, without a single dB loss, and avoid the dead spots that the potentiometers always get after a few years. Another objective was to have settings that would be repeatable: a pot is never set exactly at the same position, while the rotative selector in the Power Soak allows retrieving exactly the same setting, week after week. This choice of selectors, switches, and presets is an extremely important characteristics of SR&D products: Tom Scholz wanted devices that would behave exactly the same way months after months. Pots cannot do that: they are never set exactly at the same position from one session to another. The following charts depict the three classical configurations. One pot only, the amp must be played loud to provide power-tubes saturation. Preamp saturation is under control, but nothing has changed for the power tubes saturation. Preamp saturation is controled by the gain pot, power tubes saturation is controled by the master pot. 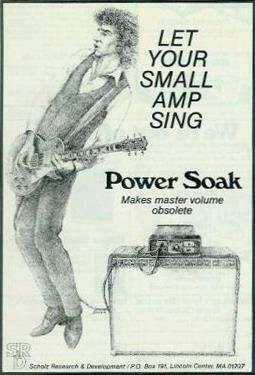 The volume is controled by the Power-Soak. Tom Scholz has built many other devices during this pre-Rockman period: the famous Hyperspace Pedal, stereo-doublers, regulated power-supplies for his tube amps, studio-oriented gear... It's quite interesting to see that the first commercial item was made for tube amps, and aimed at solving their most critical default. But after this first device, SR&D has proved that rock'n'roll could live without tubes: SR&D has built solid-state devices only.